Having a party? Let Roman Delight provide the food! Our entire menu is available for catering and take-out. All catering and take out orders are made to order just like if you were dining in – specially prepared for you! We have been helping out with parties for over 10 years – we’re perfect for small intimate gatherings or even large events! Our catering menu has such a variety of choices including salads, rolls, hoagies, hot sandwiches, pastas, chicken dishes, veal dishes, and even desserts. Our catering menu gives you a basic guide of the more popular items. 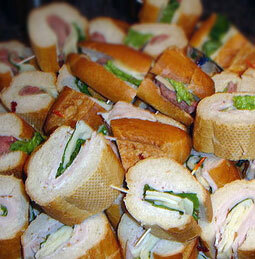 Please call to inquire about custom catering packages to suit your party. ALL entrees automatically come with a side house salad with our house dressing!